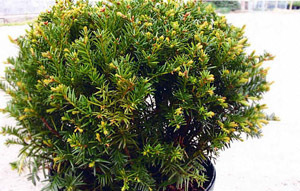 Globe-shaped evergreen with dark green foliage, commonly used as a foundation plant. Mature height is 4' with a spread of 6', although smaller size can be maintained with trimming. Requires well-drained soil in full sun. Field grown. Hardy to Zones 4-9.